With our recent focus on replacing TV time with healthier habits, and our passion for improving the lives of others (kids included) via healthy nutritional habits, it was only a matter of time before those two roads intersected. While many parents who themselves have generally healthy lifestyles (like many Whole9 readers) might not spend much time on the couch in front of the television, we often hear parents describing TV as a powerful force in their families, and a common bone of contention between parents and children. We’re going to explore the effects of television – specifically advertising targeted at children – on your kids’ health. In case you haven’t heard or noticed, childhood obesity (i.e. overnutrition) is a growing problem in essentially all developed countries, and to a growing degree, in developing countries. In the United States, more than 35% of children are overweight or obese, and that number is growing year after year. Not surprisingly, the rates of type 2 diabetes, hypertension, and many lifestyle-related diseases in children and adolescents are also rapidly increasing. Food marketers spend $1.6 billion a year (2008) to reach U.S. children and adolescents. Compare that to the “5-a-day” fruit and vegetable program, which at its peak, cost the National Cancer Institute a mere $2 million. Many researchers cite televisions’ role in the “obesity epidemic” – just Google “television + childhood obesity” and read for yourself. It’s not just that kids aren’t outside playing as much, either. The role of advertising plays perhaps the most prominent role – and in ways you might never have expected. Adults, obviously influenced by marketing strategies, are bombarded by advertising via TV, internet, text message, Smartphone apps, and many insidious guerrilla marketing techniques, including “product placement”. (If you’re interested in learning about the pervasiveness of product placement in media, check out Morgan Spurlock’s The Greatest Movie Ever Sold.) However, it is well documented that children, and in particular children under the age of 8 (and some research says 11 or 12), lack the ability to properly differentiate between entertainment and advertising, or to view advertising with an appropriately skeptical eye. A 2007 study found that preschoolers indicate a significantly higher preference for the taste of foods and beverages when such items were placed in McDonald’s packaging, compared with the exact same foods presented in plain packaging. A study of 5- to 11-year-olds found no significant difference in advertising’s effect on children of different ages; advertising impacted 11 year-olds as effectively as 5 year-olds. It is partly this kind of evidence that led countries such as Sweden, Norway, and Australia to place restrictions on advertising to children, deeming it “unfair” to prey on those not yet cognitively able to resist marketing strategies. Of course, there are no such governmental restrictions in the United States, which makes children and adolescents a clear target for marketers. 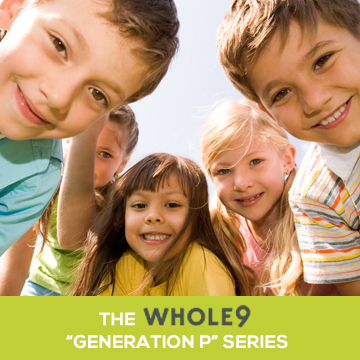 In fact, by 2006, children were already attracting over a billion marketing dollars annually. Furthermore (emphasis ours), “In addition [to TV advertising], newer forms of marketing, including product placements, viral marketing, and sponsorships, are designed to circumvent active processing of advertising information and, thus, deactivate skepticism and other defenses [to the marketing].” This means even if your child is savvy enough to be wary of advertised claims, the marketers are sneaking their sales pitch into your kids’ heads in ways they don’t even identify as advertising. Subversive? You betcha. The majority of marketing dollars are spent on advertising food products, and the majority of those dollars are spent on TV advertising. The average American child sees 15 TV food ads every day, totaling 5,500 advertisements annually. In addition, 98% (!) of those ads are for low-nutrient, calorie-dense foods that are high in sugar, sodium, and/or fat. Advertisements for high-sugar breakfast cereals and fast-food restaurants specifically dominate the market. Unhealthy eating behaviors and positive outcomes from consuming nutrient-poor foods are also portrayed frequently. Snacking at non-meal times appears in 58% of food ads during children’s programming, and only 11% of ads are set in a kitchen or at a dining table. Child marketing makes it clear that it is exciting, fun, and cool to eat great-tasting, high-calorie food almost any time or anywhere, and that there are no negative consequences for doing so. 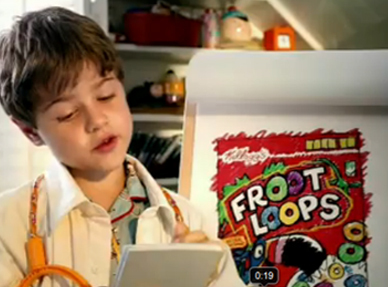 Commercials reviewed in a 2008 study depicted children experiencing visual hallucinations, being taken to an exotic location or place of adventure, exhibiting a surge in power or energy, or going from a state of sadness to extreme excitement and happiness upon consuming the advertised product. The portrayal of food in this manner is particularly troublesome, as scientists are discovering that overeating shares many characteristics with substance abuse disorders. Yes, marketers regularly and actively position adults as opponents to their advertised food – making the advertisers “on the kids’ side”, and turning the parents uncool killjoys. No wonder your kids don’t want to follow the healthy example you are setting at home. Research inspired by contemporary social cognitive theories demonstrate that food advertising can “prime”, or automatically activate, increased food consumption in children, and that these effects are not mediated by hunger, mood or advertising awareness. The reason so much money is spent on advertising to kids is because, as a textbook on marketing opens with, “Marketing works.” Exposure to food advertising significantly influences children’s food preferences, choices, food intake and product-specific food requests. In addition, children exposed to advertising will choose advertised food products at a significantly higher rate than children who were not exposed. It’s become exceedingly clear that companies who spend billions of dollars peddling their unhealthy wares to our kids do not have their best health in mind. We’re aware that caring for your children in today’s world is busy and is a delicate balancing act, and we are not proposing neat-and-tidy answers to complex problems. We’re simply recommending that you, as parents, beware the pervasive and persuasive (marketing) messages that your kids are getting via television, and, increasingly, the internet, social media, schools, and other avenues. Do what you can as parents so these messages don’t “work” on your kids. Hey lately I see Moms pushing their kids strollers and the kids are using portable DVD players and Ipads! I just dont get it. And my daughter, albeit a young adult, made her own breakfast omlette yesterday with kale. I am proud of her for sure. Now if only she wouldnt cave to the fashion media! We swore we would not let our kids be ruled by the tv and did a good job with our first, but when the second came around the tv started to sneak back in as a means to get things done. The crazy thing is there is a huge difference in the disposition of the two kids. Our youngest has an active creative mind and can play anything, anywhere, at anytime. Our youngest constantly complains of being bored and is literaly addicted to anything electronic, TV, Computer, Cell phone, and he is 4 years old! We recently completed a week of no tv for a school project for our daughter. We loved it so much, we are still going(it’s been three weeks). Our son had a hard time the first day but has come around and is now playing by himself. We now leave the TV off all week and do one movie night on the weekend where we all sit down and watch a movie. It’s awesome! Parents need to make the decisions for their children and not back down when the child fusses or fights. It takes time, it takes patience, and it takes us parents discussing food (and drink) choices with our kids. no matter how young. My husband and I are diligent about keeping our kids diets clean. As a parent, we need to make sure that the main guidance in our childrens lives is US, and not someone else. As their main influence, we need to be a good example. I think far too many parents look to convenience in their lives – fast food, TV (as a babysitter), school meals (ever seem what they serve for breakfast??? Cocoa Crispies and french toast sticks!! Good luck in school kid!). Take 5 minutes out of your day and pack their lunch to ensure that they are getting the best nutrition they can to learn. Parents need to be more responsible, not letting TV, computer, friends, etc be the influencer / educator….YOU be the GOOD influence on your child! I appreciate this post. Consequently, I wonder how much information like this really influences people who are so deeply imbedded in their way of life? I’m sure most Whole9 readers agree with the this post, and many probably already monitor TV consumption, just as they probably monitor food consumption of their kids. I definitely think it is good for articles like this to be written, but I’m sadly skeptical about the impact they have. Anyway, I agree. Good post. Thanks. Last I checked kids aren’t the ones bringing home a paycheck, paying the bills or controlling the bank account. If Mom and Dad had a little backbone and said “No” once in a while, the marketers would end up spending their money elsewhere. It’s easy to blame the marketers, but the real blame lies with the parents who are afraid to say no to little Johnny and hurt his precious self-esteem. We don’t have kids, so it’s easy for us to say, “Just don’t give in when your toddler is pitching a Level 5 Tantrum in the middle of Safeway.” There are obviously more issues at play than whether Mom and Dad have a backbone, but we WILL agree with one point – this is, in part, a family issue. We also believe it’s a societal issue, a local community issue and a government issue. Our article was directed at just one link in the chain, with the hopes that parents can better fortify their “eat good food” message by keeping a careful eye on their kids’ TV habits. I don’t mean to sound harsh (okay, I do a little) but the reality is that even though there may be “more issues at play than whether Mom and Dad have a backbone,” the only thing that can change in time to make a difference for kids growing up *right now* is Mom and Dad. I have kids who are 12, 10 and 3 and if they are eating Fruit Loops for breakfast and driving through Wendy’s for lunch, it’s not big business and the government driving them and paying for that garbage; it’s ME. If I wait around for big business and government to change The Way Things Are, my kids will end up as fat, diseased adults. So I say no frequently. It’s not always fun to be the bad guy, but if I don’t do it nobody else will. I understand that it’s hard to give parenting advice when you haven’t been down that road yourself, and believe me I appreciate your forthrightness about that! But as most of us who have embraced this type of lifestyle know, we have to be responsible for ourselves because no one else can fix our diet and health for us. We parents need to understand that we have that same responsibility for our kids. Thanks for your site and efforts. So, thank you for saying it straight, from the official “been there, done that” perspective. We love it, even if others might not. PS Congrats on your Whole30! This reminds me of that line in “Supersize Me” where the guy says that every time he drives past a McDonalds he’ll punch his kid in the face in order to associate negative feelings with McDonalds. Pretty funny (in context) but a lot less [severe] deprogramming is required when you avoid the marketing influence in the first place. Our five kids only watch videos we’ve prescreened or read about. And then only on netflix on-demand or dvds. We occasionally let them watch DVR’d shows (they love Wipeout) but they skip through the commercials just like we do. This is worth watching. I was a part of a community viewing of the movie and panel discussion on this topic, and it was alarming to me how little most parents understand the commercialized environment in which their children live. While I agree that it is the parents who are allowing their chidlren to eat these foods and watch televisions, most adults aren’t aware of proper nutrition. They were getting the same messages when they were young, though not to the same degree it is available today. The standard American diet has never been ideal. With over 1/2 the population being either overweight or obese, most children don’t have any positive role models. It is easy to sit here and judge, but that is doing nothing to solve the problem. The politics surrounding our food supply and the way it is marketed and what needs to be done to fix things, go way beyond “don’t buy the fruit loops stupid”.